It tastes like sour cream but better…sour cream with a texture and tartness that leans into chèvre territory. It takes 2 minutes of hands-on time to make it. You mix yogurt and salt together and wait around while the whey seeps from it. You’re making cheese! That makes any day a total success, regardless of what does or doesn’t happen next. 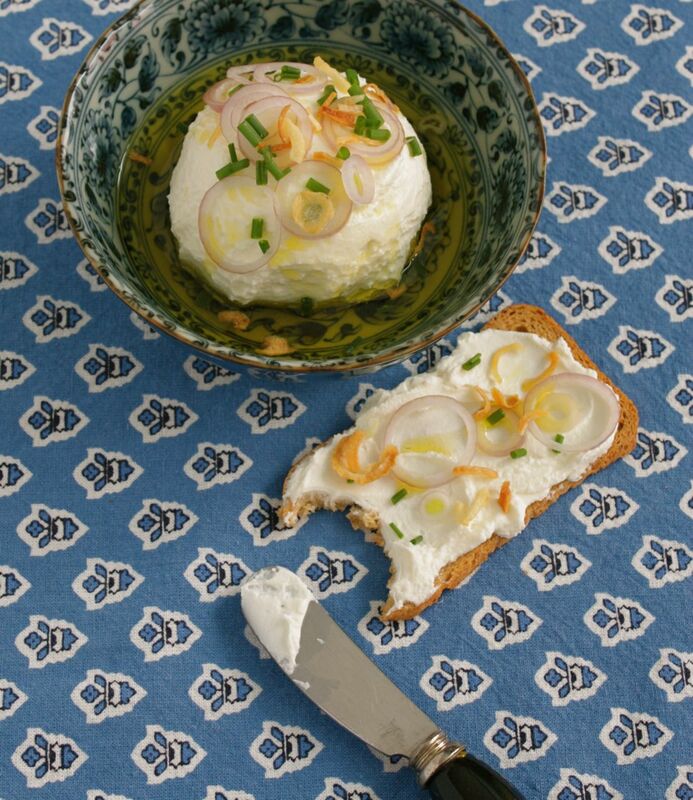 Make this in the morning, lay on the couch all day and at night, look back and smile knowing you made labneh. Homemade cheese. Impressive. If you’re really trying to impress yourself, the next day you can roll some of the labneh into balls to be added to a jar of olive oil, spices, herbs, etc. and let them sit in jars in the fridge to marinate. Hours later when you’re back on the couch and you’re spreading the labneh over crackers*, scooping it up with pita, etc., remind yourself that in a sense you’ve now made two kinds of cheese in one weekend (plain and flavoured counts as two). Congratulate yourself on yet another job well done. And for Pete’s sake, take a break, you’re making everyone else look bad. *For days when you want to impress others (to no end!) throw some ingredients in a food processor and serve some pesto with your labneh. The ideas, and the accolades, are endless. Make sure your hands and any instruments are clean throughout this process. Line a colander or other large strainer with two large pieces of cheese cloth, leaving ample overhang all around, then set the colander securely over a large bowl, leaving plenty of room between the two. Combine the yogurt and salt together and mix well, then pour into the centre of the cheese cloth and set aside for 5-10 minutes. Much of the liquid–the whey–will drip into the bowl. (The whey is apparently quite healthy and stores for weeks refrigerated if captured in a sterile bowl and stored carefully–use to cook grains or add to cereal, etc.) Remove whey to store for another use or discard it, then set colander over bowl again. Lift all sides of the cheese cloth evenly use the cloth to push the thickened yogurt into a somewhat flat ball in the centre. You can tie off the cheesecloth to form a bag and leave in the centre of the colander over the bowl, or you can hang the cheese cloth with a hook in your fridge to hang over the bowl. Either way, refrigerate. Check in a couple of hours to make sure the whey doesn’t overflow and empty bowl if necessary. Leave in fridge for 24-36 hours, pressing on the cheese cloth with clean hands once or twice to help extract the liquid. Unwrap cheese cloth and transfer labneh to a bowl to serve or to an air tight container to refrigerate until ready to use (should last 1 week refrigerated.) You can also roll the labneh into small balls, transfer to a jar, top with olive oil, herbs, chilies or other spices and marinate the labneh this way for at least a day and store for even longer than a week, refrigerated.